Did you have a good rest after long drive to Yosemite and Sequoia? Good, as today will be a lot of driving too. Death Valley National Park is the hottest, driest and lowest place in US and during summer temperature can reach 35-50C (100-120F), so you must be prepared. Park administration recommends drink at least 4 liters (1 gallon) of water. It is up to you how much you drink, but in your car you should have some water for emergency. It is quite remote place and don’t expect huge crowd of visitors, except some more popular places like Badwater or Devil’s Golf Course. It can take hours till you see another car. I bought 10 liters water container just in case. Also fill up your fuel tank before going into park. Some years ago it was couple gas stations in the park at Stovepipe Wells Village and Furnance Creek. But now only the one at Furnance Creek is working. 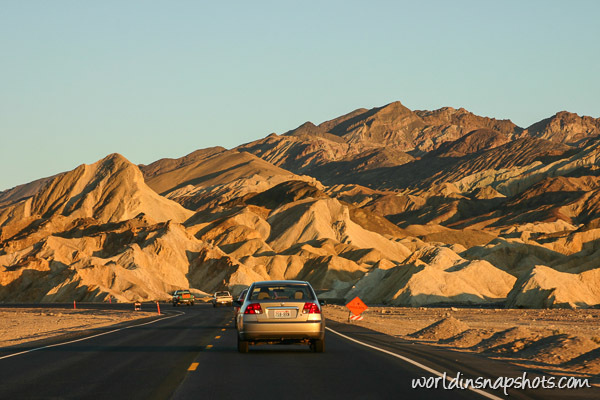 The last thing you should do before going to Death Valley – check for road closures. During my visit Artists Drive, Twenty Mule Team Canyon and Titus Canyon roads were closed, at Zabriskie point were road works and was no stopping allowed, so I was forced adjust my itinerary accordingly. Death Valley NP is 350km (220 miles) or 3.5 hour drive away from Bakersfield. 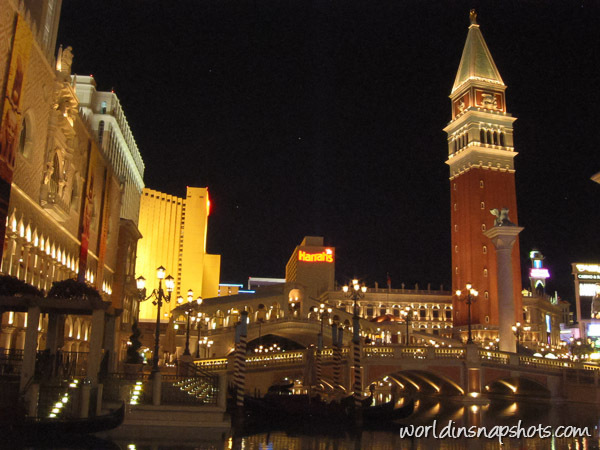 From Death Valley to Las Vegas is another 220km (140 miles) or 2.5 hour drive. Expect to be in Vegas at late night as it easy to spend all day in the Death Valley and wait for sunset to watch how colors of surrounding mountains are changing. 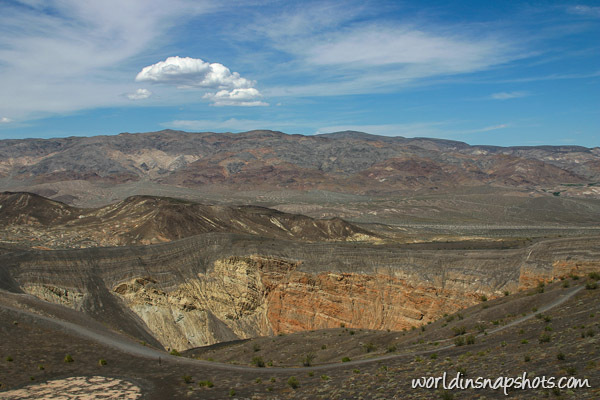 Ubehebe Crater – it erupted more than 300 years ago. 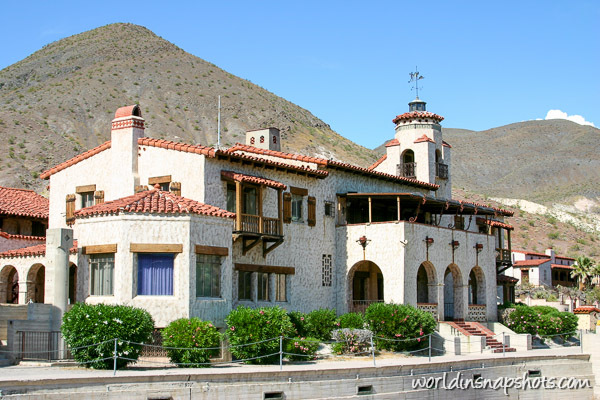 Scotty’s Castle – Spanish-style mansion in the green oasis of Grapevine Canyon. 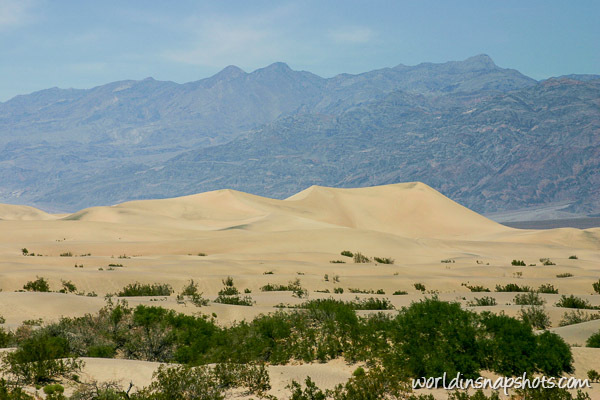 Mesquite Flat Sand Dunes – 30 meters (100 feet) dunes rising near Stovepipe Wells village. 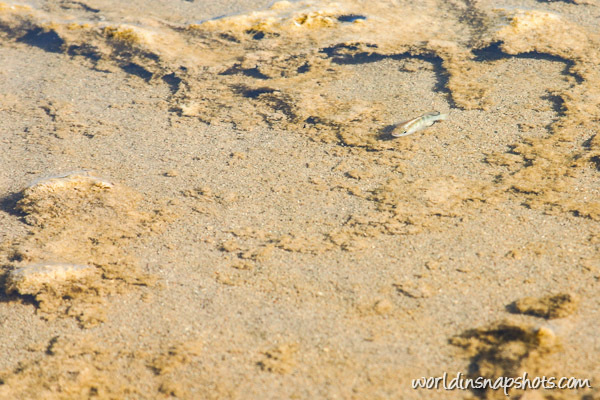 Salt Creek – this salt water is home to a rare pupfish. Titus Canyon – one of the largest and most scenically diverse canyons in the park. Small part of this drive can be accessed by regular car from West side. Artist’s Drive – 14 km (9 miles) scenic loop drive through colorful volcanic formations. Natural Bridge – 800 meters (0.5 mile) hike to massive rock span across canyon. 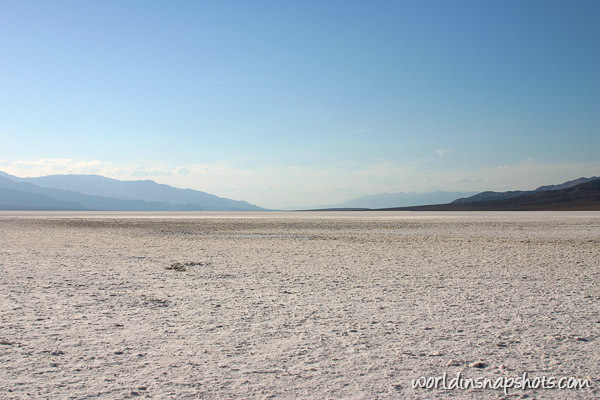 Badwater – lowest point in North America. It is 86 meters (282 feet) below sea level. 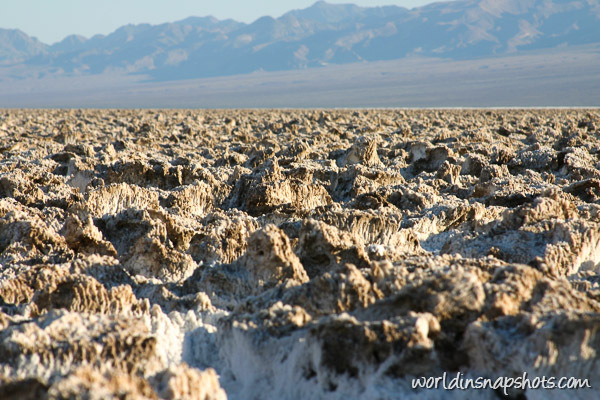 Devil’s Golf Course – incredible formations of rock salt. Dante’s view – one of best places to see Badwater basin from the top of 1.7 km (5500 feet) peak. Twenty Mule Team Canyon – 4 km (2.5 mile) one way loop drive through badlands. All these places are accessible by regular vehicle. Check Death Valley NP website for additional places if you drive high clearance car, but for day visitor it will be more than enough. The Fall of Atlantis and Festival Fountain at Caesars Palace (every hour on the hour Sun – Thu, 10am – 11pm, Fri and Sat, 10am – midnight) .